Hello. I've been experimenting with gimpressionist and have noticed that no matter how I tweak the settings, every time I hit the preview button it changes slightly. Is there any way to get rid of this randomness? (Sep 5, 2014 17:04)in3D Wrote: Hello. I've been experimenting with gimpressionist and have noticed that no matter how I tweak the settings, every time I hit the preview button it changes slightly. Is there any way to get rid of this randomness? I wish I could help you but I can not. 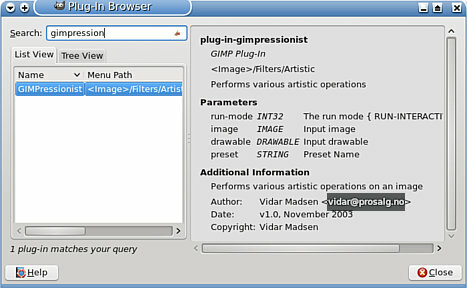 Gimpressionist is one of the oldest of the artistic Gimp plugins and seems to have a degree of randomness built in. Perhaps contact the author of the plugin? This dude's page hasn't been updated in like 13 years. Should I contact him? EDIT: Checked the actual home page. It's only been 4 years. Still though... guess I'll see. EDIT 2: How do I contact him? Can't find his email and it doesn't seem he responds to his blog. Quote: This dude's page hasn't been updated in like 13 years. Should I contact him?